Dr. Rob, as he prefers to be called, was in an automobile accident in 2003 which led to his decision to enter vet school. His precious pooch Molly was along for the ride when the accident occurred. Molly was left with not only a broken hip, but also a broken front arm. Rob was heartbroken and found himself introduced to a veterinarian that would change his life forever. He had known he wanted to enter the medical profession, but this chance meeting with Dr. Trina Bailey saw him look at the world of veterinary medicine. 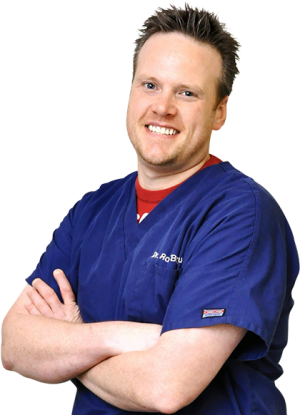 Dr. Bailey’s compassion for both pet and owner amazed Rob, and he saw that his love of animals combined with a love of people could lead to a successful career. Through the course of Molly’s recovery, Rob applied and was accepted to the Louisiana State University School of Veterinary Medicine and observed another mentor, Dr. Kenny Arceneaux. This encounter sealed the deal, and Rob knew becoming a vet was the way forward for him. Since becoming a veterinarian in 2009, Dr. Rob has remembered those that paved the way for him and has paid homage to them by continuing their tradition of kindness, compassion and educating pet owners about the proper care and needs of their animals. His love for all creatures great and small shines through from the moment you meet him.